Veteran Ipswich couple Alf and Maureen Capri have been named as joint winners of this year’s third annual Speecafe.com Spirit of Speed Volunteer of the Year award, presented by Michelin. Alf was one of the founding members of Karting in Queensland during 1958 and two years later met his now wife of almost 60 years, Maureen, while on a night out at a famous Brisbane dance hall. In fact, he asked her out on a date the very next day, where he took her to watch him race at a local track, and they have been virtually inseparable ever since. Tonight’s winners were announced at the Australian Motor Sport Hall of Fame gala by Speedcafe.com founder, Brett ‘Crusher’ Murray, and the trophy presented by Michelin Australia’s Marketing Manager, Swaroop Tulsidas. “This is a wonderful surprise and so, so unexpected. We thought we had been invited down to fill up the table. We just are involved in the sport because we love it,” said Maureen. “Karting is the grassroots of the sport and we love to see all the drivers progress through their careers. While Alf was racing, Maureen got involved in the administration side of the sport and at one stage was Queensland State Secretary for an 18-year stretch. Since hanging up the helmet in the early 1990s, Alf to has been instrumental on the technical side of the sport. They are both life members of Karting Australia, Karting Queensland, the Ipswich Kart Club and the Warwick Kart Club. Through the years they have held a variety of roles, including State Secretary, State Technical Officer, Club Delegates, Stewards, Timekeeping and any other roles that have needed filling. They are still very active in the sport with Maureen, 78, remaining as the Ipswich Membership Officer and Alf, 76, officiating as the technical officer at almost every event held at Ipswich and the surrounding region in some official capacity. “When the SpirIt of Speed award was created three years ago it was designed to reward people of the quality of Alf and Maureen Capri,” said Brett Murray – Founder, Speedcafe.com. “They are the epitome of what being a motorsport volunteer is all about and are simply a first class team that has dedicated themselves to the sport at the grassroots level. 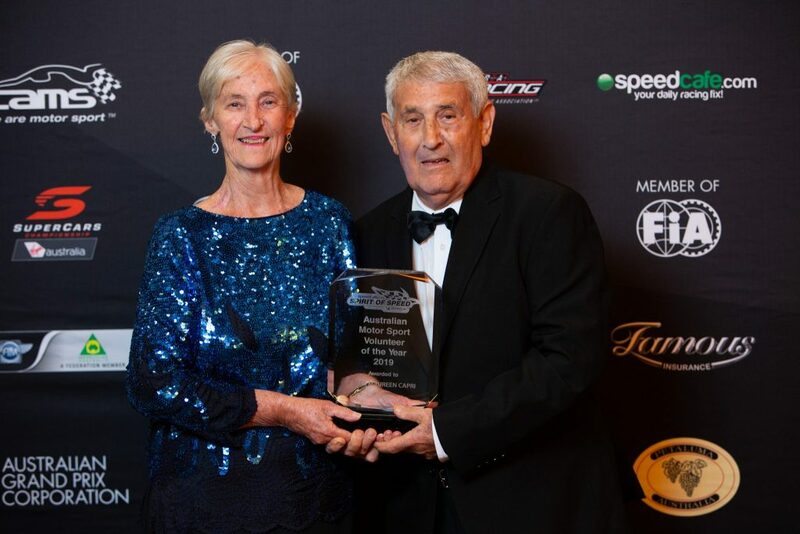 The inaugural Speedcafe.com Spirit of Speed award was won by Victorian drag racing veteran Paul Rogers Snr, who has dedicated more than 50 years of his life to the sport. Veteran Victorian flag marshal Roger Chirnside won last year’s award after being named CAMS Official of the Year and the FIA’s Outstanding Senior Official of the season for 2017. As the winners of the award, the Capris receive a beautifully boxed trophy, a $2000 travel voucher to be used for motorsport business or pleasure, and $1000 worth of MICHELIN performance tyres for their road car.